Head out on a fun packed one week Oregon winter vacation, and explore scenic mountains, rivers and lakes. Departing Portland our tour takes you along the impressive Columbia River to Mt. Hood, a major winter destination. You have the chance to relax at the historic lodge, or hit the slopes with skis, snowboard or snowshoes. Onward bound to Mt. Bachelor we arrive in the heart of Oregon, where the town of Bend welcomes us with its artsy charm. Spend a full day enjoying winter activities on Mt. Bachelor. Snowshoe along snowy Crater Lake National Park. Our tour continues on to Klamath Lake and the nearby Klamath Basin National Wildlife Refuge, an amazing location for bird watching. A stop at Lava Beds National Monument gives us a chance to explore these long lava tubes before heading to our end tour destination in Ashland, OR. Our winter vacations offer a chance for nature enthusiasts and photographers to experience the Oregon winter with a small, like-minded tour group. Short winter days offer perfect lighting for photographers! Landscapes are untouched, and there are virtually no crowds, except at the popular ski destinations where winter sport enthusiasts will get their fill. Combining some well known sights with magnificent ‘out-of-the-way’ locations this tour packs in highlights while giving you time to relax. Spend the evening meeting your tour guide and driver at the hotel, then head to dinner together at a river side restaurant in Portland. Receive your detailed tour documentation and go over the tour itinerary. We recommend you arrive in Portland a day or two early to have time to explore this city with its art museum, Chinese garden, parks and the fascinating OMSI science museum. One night Portland. Drive along the scenic Historic Columbia River Highway with many wonderful views of the mighty Columbia River and its surrounding forests. A stop at Multnomah Falls outside of the main tourist season allows you a chance to see Oregon’s tallest (at 620 feet) waterfall without the usual crowds. Our next stop brings us to the impressive Bonneville Lock and Dam with its informative visitor center. After lunch visit the unique Western Antique Aeroplane and Automobile Museum (WAAAM) in Hood River before heading up to the Timberline Lodge on Mt. Hood. Mt. Hood is a ski destination and offers views of the surrounding area on clear days. Relax at the historic lodge or choose to buy a lift ticket and go skiing for the evening hours. Snowshoe rentals are also available. One night near Mt. Hood. Snowshoe in the heart of winter along the powdery banks of Trillium Lake this morning. Then settle in for a scenic drive to Bend, Oregon. A late lunch is followed by independent shopping time in Bend’s historic downtown, complete with a variety of rustic architecture, galleries and boutiques. After check-in at our hotel you are free to relax for the evening, or catch a shuttle up to Mt. Bachelor. 2 nights in Bend, Oregon. Immerse yourself in winter fun with optional activities ranging from skiing or snowboarding on Mt. Bachelor’s groomed slopes, relaxing on a romantic sleigh ride, catching the wind on a thrilling dog sled adventure or taking a snowshoe hike along one of many of the mountain’s scenic snowshoeing trails. With a warm and comfortable lodge that offers refreshments nearby this day can offer the perfect combination of relaxation and excitement. Learn about the unique high desert environment and take a peek at a variety of desert creatures at the fascinating High Desert Museum. A beautiful drive takes us through the heart of Central Oregon and south to Crater Lake National Park where we’re staying in cabins just outside of the park. An evening drive up to the crater rim gives you a chance to see the sunset over one of the West’s most incredible snowy landscapes. This morning we will go for a snowshoe hike along the Crater Lake Rim. Crater Lake is the deepest lake in North America, with an incredible blue color that contrasts with the bright white of the snow. The National Park has an informative visitor center that we stop at, you can watch a video, browse souvenirs, and learn about the history of Mt. Mazama – so called before this ancient volcano blew its top and became a crater. In the afternoon drive on to Klamath Lake and the wildlife refuge there. Night in Klamath Falls. 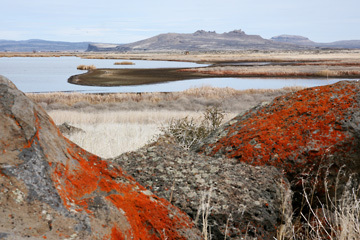 Visit the southern part of the Klamath Basin National Wildlife Refuge. Spot bald eagles, some years there are up to a thousand of this majestic bird within the refuge. Waterfowl is seen by the thousands, covering the marshlands. We stop at the visitor’s center to get an overview of birds you will be able to see before embarking on our driving tour of the area. Keep an eye out for otter, muskrat and deer, all of which can be seen within the refuge. The afternoon takes us to the Lava Beds National Monument. Pick up your lanterns at the visitor center and let’s go spelunking! There are lava caves for every skill level. Evening drive to Ashland, OR. Ashland, OR offers many different sights. On this day you can book an optional wine tour of the area, visit galleries downtown, or explore the beautiful Lithia Park. Our tour officially ends today, but there is much to be seen in the area! We’re happy to help you discover southern Oregon. Fly out of Medford, Oregon’s International Airport. If you have any questions please feel free to contact us at info@traveldreamwest.com. These Oregon winter vacations leave from January to March and can be reserved for a group as custom adventure travel tours.